A new Io-related paper in the journal Icarus was posted online on Sunday titled, "Io: Heat Flow from Dark Volcanic Fields." The paper is authored by Glenn Veeder, Ashley Davies, Dennis Matson, and Torrence Johnson. 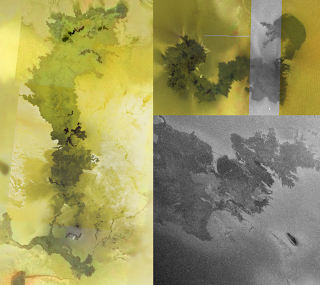 The authors in this paper attempt to estimate the amount of Io's overall heat flow that is radiated from the large volcanic lava flow fields that cover a sizable portion of Io's plains, distinguishing these features from the myriad of volcanic pits, the background heat flow, and the big daddy of Ionian volcanoes, Loki Patera, which by itself radiates 5-15% of Io's total heat flow. 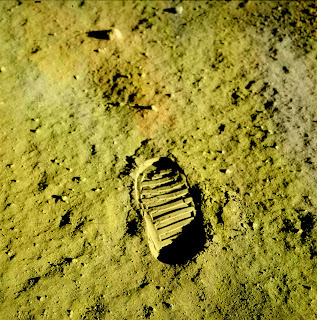 This research was previously discussed last year on this blog when the authors of this paper submitted a print-only abstract to LPSC 2008. 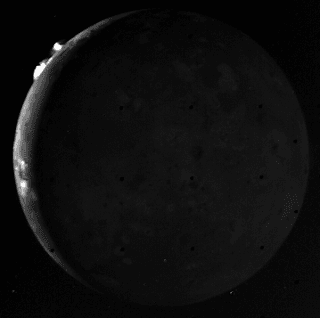 Dark volcanic fields on Io are thought to consist of recently active, compound silicate lava flows that have erupted onto the plains of Io, rather than being confined within a patera (volcanic pit). Lava flows of many colors have been observed on Io, but it is the black or dark green flows that are thought to be the most recently active silicate flows. These flows tend to be lava channel (or tube)-fed, with smaller outbreaks building and growing the flow field over time. For example, if you look at Amirani above, you see "small", fresher lava flows on top of older, dark green lava. The dark green color comes from the deposition of sulfur on still-cooling, iron-rich silicate lava flows, producing iron sulfide. Brighter flows represent either older silicate flows that cooled enough for sulfur and sulfur dioxide to condense on their surfaces or sulfur-rich lava flows. Either way, bright flows were not considered in this analysis. Veeder and his colleagues estimated the contribution of Io's dark lava flow fields to Io's total heat flow by first identifying all the dark lava flow fields visible on Io in the USGS global map and calculating the area of each flow field. Their areas were found by measuring the number of pixels below a threshold limit for each dark flow field (the threshold valuing varying with each flow field) while also removing other possible dark features such as paterae. 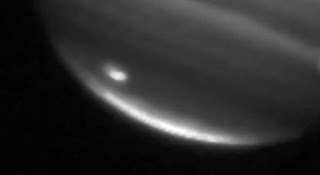 Using this method, the authors identified 28 dark flow fields, including features such as Masubi Fluctus, Marduk Fluctus, Amirani (above left), and Prometheus (above upper right), covering slightly less than 1% of Io's surface. The authors also excluded more transient lava flows like Pillan and Thor, though sources such as these may provide a significant amount of the heat flow contribution from dark flow field heat, even if the specific sources changes over time. The authors then seem to be more focused on persistent volcanoes. The authors note a peak in the distribution of dark lava flows in the anti-Jovian hemisphere of Io, opposite Io's most powerful volcano, Loki Patera. Next, the authors estimated the effective temperature (akin to an average nighttime temperature of each lava flow) and the total radiating power for each flow. For many of the flows, infrared data, either from the NIMS or PPR instruments on Galileo, is available, allowing for a more accurate estimate of the heat flow of each flow. For cooler flows, more accurate estimates tend to come from the PPR data since much of their heat is radiating out at longer infrared wavelengths to which PPR was more sensitive, compared to NIMS, which was more sensitive to warmer heat sources. However, for more than half of the dark lava flows examined in this study, no radiative power estimate is available. For these flows, the authors assumed an effective temperature of either 130 K or 115 K, depending on whether surface changes or other signs of recent volcanic activity have been observed. 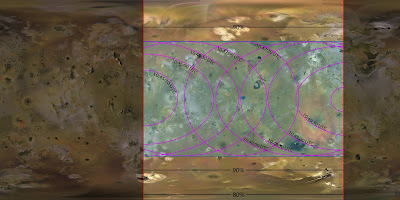 The authors' estimate that the 28 dark flow fields they examined provide 5 x 1012 Watts to Io's global heat flow, or about 5% of Io's total heat flow. This amount is similar to Loki when it is quiescent. 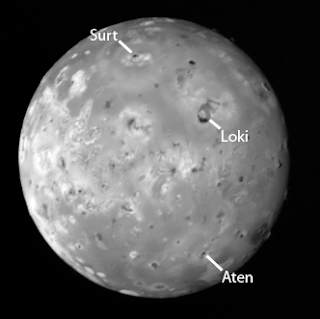 While their effective temperatures are cooler than many of Io's active paterae like Loki Patera or Pele, their larger surface area compared to Loki Patera (an order of magnitude greater) allows them to contribute a large amount of Io's heat flow. 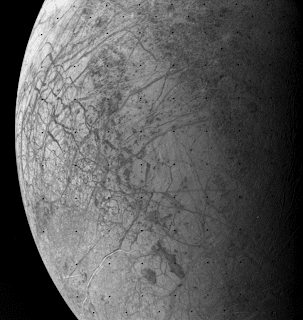 It should be noted that this analysis excluded brighter flows, which may provide an even greater percentage of Io's total heat flow despite having even cooler effective temperatures, a possible later research subject as Io's heat flow budget is broken down further (to an extent this has with Glenn Veeder's earlier work on the possible excess heat flow from Io's polar regions). In other news, the blog Kentucky Space has the latest edition of the Carnival of Space. 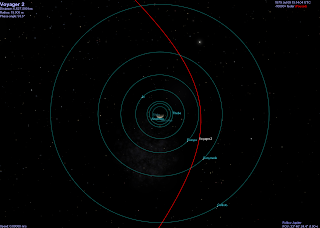 Worth checking out to get yourselves caught up on the celestial blogosphere. 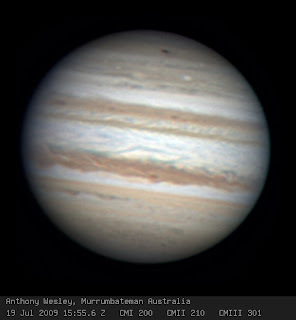 Computer Animation of the total eclipse of the Sun by Jupiter's moon Ganymede over the trailing hemisphere of Io on July 8, 2009. 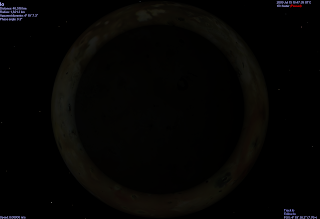 First half shows a view from 7,317 km above Io's northern trailing hemisphere. Second half zooms in on the sun from the floor of Loki Patera showing the total eclipse. The animation runs from 07:30 to 08:20 UTC on July 8, 2009.